The RatStar, manned by the MUTANTS, attacks the Feliner. S-S-SLITHE, MONKIAN and JACKALMAN are ejected from the RatStar and fall toward the ground. They are saved from certain destruction by MUMM-RANA, a female mirror image of MUMM-RA, a force for good who lives in a White Pyramid. 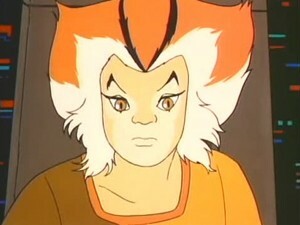 MUMM-RANA is led to believe that the MUTANTS are good and the THUNDERCATS evil. MUMM-RA enthralls her and turns her power against the THUNDERCATS She puts the Sword of Omens in stasis and threatens the Lair itself. LION-0 disguises himself as a wealthy TABBUT and, with TYGRA’s help, sets himself up to be robbed by the MUTANTS. MUMM-RANA witnesses the attack, and the true and evil nature of the MUTANTS is revealed to her. 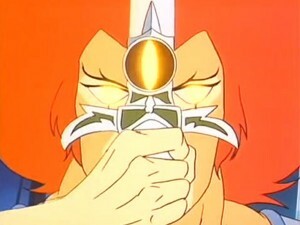 The revelation breaks MUMM-RA’s spell and MUMM-RANA releases the Sword of Omens. 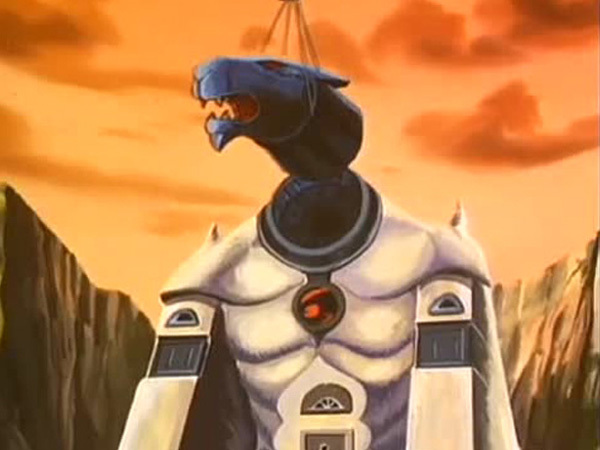 MUMM-RANA and the THUNDERCATS now defeat MUMM-RA and the MUTANTS, but her ordeal threatens to destroy MUMM-RANA. In a desperate race for time, the THUNDERCATS return her to the White Pyramid, where her powers are rejuvenated. When the Mutants, in the RatStar, lose a confrontation with the ThunderCats’ Feliner, their ship breaks up and they plunge free into space. But they find themselves rescued by Mumm-Rana, and they discover her and her world. 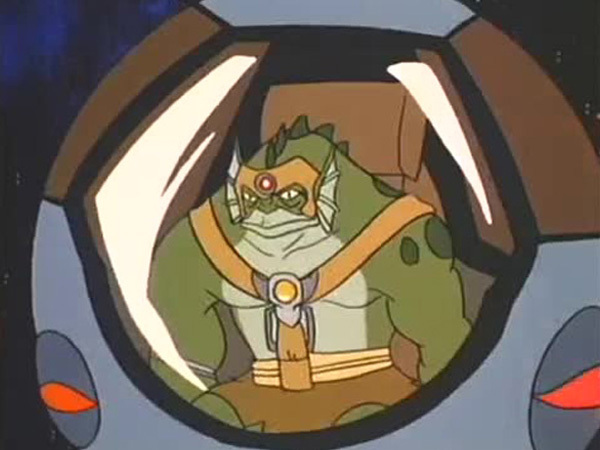 Mumm-Rana, who lives in a pyramid with a tomb chamber, appears at first to be just like Mumm-Ra. But she is, in reality, his opposite. Where Mumm-Ra is the epitome of evil, Mumm-Rana is a spirit of good. 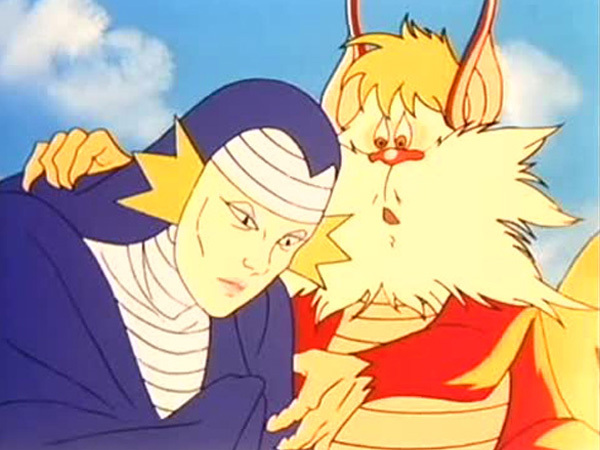 Mumm-Ra appears and, after a stand-off, succeeds in taming her by casting a spell on her. 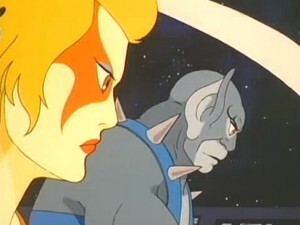 He convinces her that the ThunderCats are evil enemies and she in her goodness must help vanquish them. Together, Mumm-Ra and Mumm-Rana attack the ThunderCats. They prove formidable. Because the Sword of Omens will not harm goodness, it is disarmed by Mumm-Rana and placed in a cocoon. And the ThunderCats are exiled. It is only when Lion-0 is able to impress upon Mumm-Rana that they are good and not evil that the ThunderCats are able to persevere. 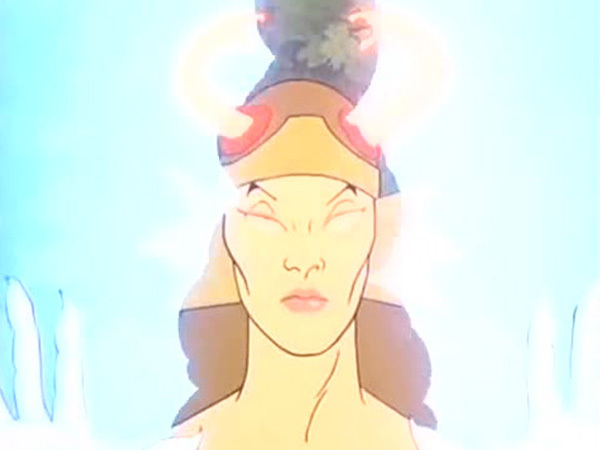 The realization of Mumm-Rana releases her from Mumm-Ra’s spell and she frees the Sword of Omens. Together, Lion-0 and Mumm-Rana confront Mumm-Ra and repel him. And the ThunderCats are able to return Mumm-Rana to her habitat and resuscitate her powers. 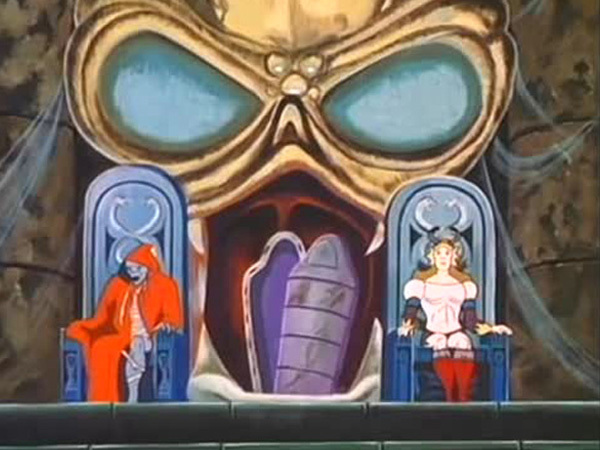 Good and evil are indeed opposites, and Mumm-Rana and Mumm-Ra represent their characteristics in this episode. The peace and serenity of Mumm-Rana contrasts with the estrangement and self-hatred of Mumm-Ra. Evil may at times seem more powerful than good, because it is ruthless and plays by its own rules and not the accepted rules of a moral code. it may even set aside goodness for a time. But in the overall scheme of reality, good is stronger and its effects more powerful. Human nature has a basic propensity for wholeness and to be in peace and harmony with itself, rather than fragmented and alienated. When it responds to goodness, our nature is strong and secure, full of the power that comes from self-respect. This sense of wholeness and fulfillment is a stronger attraction ultimately than the effects of evil, which breeds only disrespect. 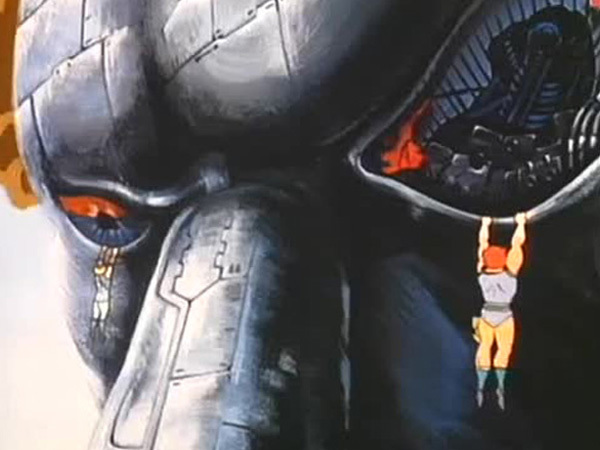 We should commit ourselves, like Lion-O and Mumm-Rana, to alignment with the course of goodness. In doing so, we will receive the highest reward, self-respect. When it comes to Michael Bay’s movies, the general consensus among critics is that the audience should leave their brains outside the cinema. “Mumm-Rana” is one such installment in the ThunderCats series which requires a considerable suspension of disbelief to be enjoyable. 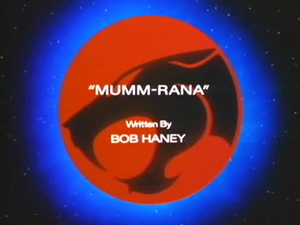 Written by Bob Haney, the author of many fantastic ThunderCats episodes, “Mumm-Rana” is his last and arguably weakest contribution to the series. Haney takes the easy route of picking an existing character and creating a mirror opposite of it. 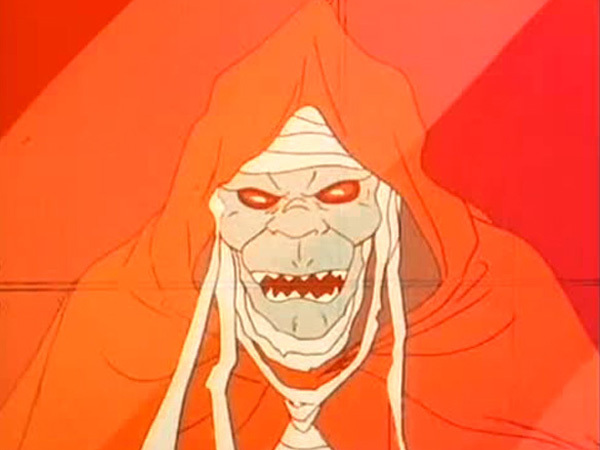 In this case, it is the main antagonist Mumm-Ra, whose every trait (including his gender) is inverted to give birth to Mumm-Rana. She is a mummified sorceress who can transform into a powerful version of herself and even has her own White Pyramid, complete with a sarcophagus, four statues and a cauldron. Not only does Haney put very little thought into the titular character, his script is equally lazy. In order to distract the viewer from the plot (or lack thereof), the writer infuses the episode with numerous battle scenes. Many interesting aspects such as the ThunderCats laser-mapping the star systems are touched upon but aren’t explored fully enough. This results in a rushed story that constantly jumps from one action sequence to another. It is hard to fathom that a brilliant writer like Haney, who is responsible for conceiving memorable characters like Wizz-Ra, the Snowman of Hook Mountain, and the Enflamer, could invent a banal persona like Mumm-Rana. 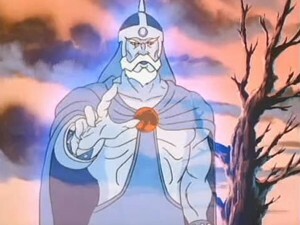 Even Wizz-Ra, who is an antithesis of Mumm-Ra in many ways, is given ample character development, an intriguing back story, and an original design in “Dimension Doom”. But so little thought is put into Mumm-Rana’s character that even her chant, “Ancient spirits of goodness, transform this gentle form to Mumm-Rana the ever-good”, sounds campy! Despite being a largely male dominated show, there are strong female characters on ThunderCats . Cheetara, Willa, Mandora, all are capable of carrying an entire episode. As a character, Mumm-Rana does not possess such strength. 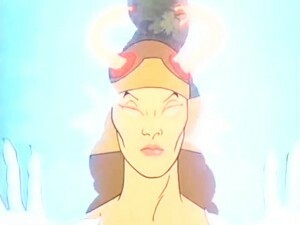 Despite being a sorceress with powers that equal those of Mumm-Ra’s, she is effortlessly hypnotized by the devil priest. And the worst fate that she can bestow upon the Sword of Omens is to cover it in a spider-like web. The implausibility of the narrative is further weakened by the uninspiring resolution. Lion-O succeeds in breaking Mumm-Ra’s control over Mumm-Rana by putting on the guise of a Tabbut (a race of pig-like beings) and letting the Mutants attack him, thereby convincing her that the Mutants are evil. And Mumm-Ra being defeated in the most monotonous of methods by being shown his reflection, adds to the tedium. At least Haney brings a little bit of novelty by using the side of the Feliner as the reflective surface. It’s a good thing that Panthro regularly waxes the spacecraft! Even a couple of good visuals do not help to elevate the overall quality of “Mumm-Rana”. The plot did have a lot of potential but Haney failed to develop any of it. As a result, this sorceress driven episode fails to cast a spell on the audience. Even though the RatStar appears briefly near the beginning, neither of its regular pilots, Ratar-O or Vultureman, appear in this episode. The scene of the Cats’ Lair being decapitated is reminiscent of the same fate suffered by the ThunderCats’ fortress in “Return to Thundera”, also written by Bob Haney. When Mumm-Rana banishes Lion-O, Tygra, and Snarf to eternal exile, it turns out that she merely transported them near Castle Plun-Darr! 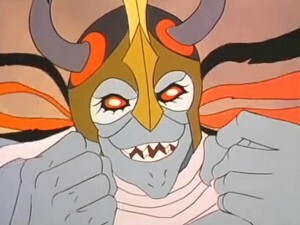 When Mumm-Rana falls under Mumm-Ra’s control, two snake heads appear on her helmet, similar to Mumm-Ra’s.